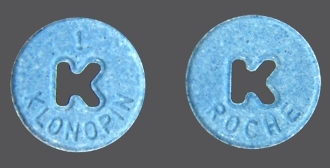 Klonopin is part of a group of drugs that have a complex effect on humans. In the practice of treatment of dependence on opiates, this substance helps to remove the withdrawal syndrome. Having assessed the severity of the condition against the background of the abolition of the drug, you can use both Klonopin monotherapy and its combination with other drugs used in detoxification. anticonvulsant action (with epileptic seizures). Its action can be manifested individually. Some complaints can be eliminated completely, while others can’t withdrawal at all, or be slightly facilitated. You should be ready to replace Klonopin with other anxiolytics. The drug can be addictive, so the duration of its use should be limited. There is a possibility of an overdose. Some people against the background of taking the drug may develop excessive mental and physical depression. The composition of the tablets includes different amounts of the main active substance. 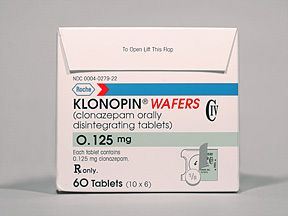 Pharmaceutical companies produce Klonopin with doses: from 0, 125 mg, to 2.0 mg. Increased inhibition of gamma-aminobutyric acid (GABA) transmission of nerve impulses. This gives an anticonvulsant effect. Slowing the excitability of cortical and subcortical structures of the nervous tissue, which leads to a decrease in anxiety and fear, eliminates the excessive emotional tension. The change in metabolism in the structures of the brainstem, which leads to the removal of general anxiety. In the treatment it is important to follow all recommendations. In this case, the result of therapy will be better. To select an adequate dose, duration of reception, correctly to distribute the multiplicity should only the doctor. Best in the clinic. Self-administration is less effective and dangerous with the development of complications. The reception should be continued as little as possible. On average, this period is 3-4 days. Sometimes more. This measure is necessary to prevent the development of dependence. The average one-time dose is 0.5 mg. In the most severe cases, or at night, it can be increased to 2.0 mg. Drugs are taken orally. Observance of the rules established by the doctor, allows to reduce manifestation of opiate abstinence much. What side effects can there be? In some cases, complications develop on the background of taking Klonopin. Their frequency and intensity depends on the individual characteristics of the patient. There are can be changes in the blood: a decrease in the number of major blood cells, an increase in the concentration of alkaline phosphatase, transaminase. This problem can arise with the uncontrolled reception of Klonopin. In this case, it is required to immediately stop taking the drug, to perform gastric lavage with drugs that have the properties of adsorbents, to prescribe symptomatic treatment. If Klonopin is taken for a long time, its effect is weakened. Do not abruptly discontinue the medication, as depriving the patient of a dose may give an abstinence syndrome. Alcohol is categorically contraindicated for all patients. It is not recommended on the background of taking the medicine sits down for driving a car. Acute symptoms of opiate addiction withdrawal for several days. It should be borne in mind that anxious and panic attacks, mood swings and other problems can be observed for a long time. Any person who takes opioid-based medicines requires the mandatory support of a psychotherapist.